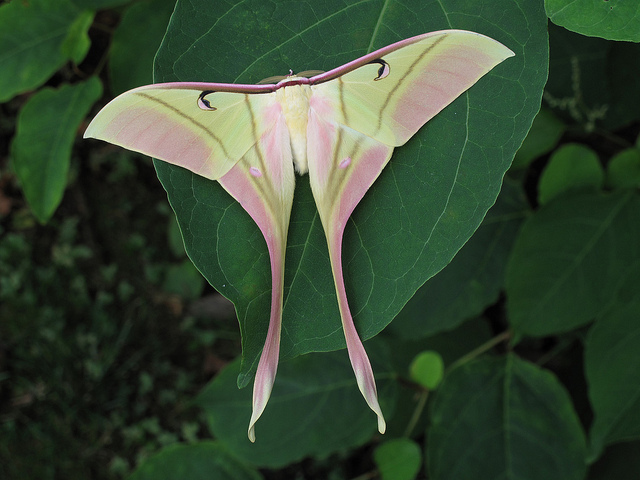 I am happy to see the luna moth honored in this posting, and in the beautiful poem. I had an encounter earlier this week with a male luna moth (I say it was a male because you described the beautiful leaf-like, delicately veined antennae on the male moth). I was letting my dogs in the back door at night and saw something large fying just outside the door. I thought it might be a bird, and it looked like it might fly in the house. Instinctively I closed the door. The moth ended up on the deck and our dog must have snapped at it. It was badly injured. The wings were still perfect, and what a sight to see. But the body had been badly damaged and it could not fly. I felt so sorry. I lifted it up and held it in my hand and told it how sorry I was. I felt some sort of communication. It was really heart-wrenching. I decided to put it back on the deck, in hopes that some night bird might grab it up quickly. The next morning it was still there, just as alive as before. I struggled with where to put it, what to do for it. I left it under a tree. It lived another night and day. Finally, at the very end, I brought it inside to spare it from the ants. I was very touched by this exquisite creature. I hope it had a chance to pass on that beauty to a female before it came to my back door! A male Luna Moth has landed on my front door step this afternoon. I am so intrigued by him that I had to look up more information about this creature. I came across this story on the web. I feel like this Moth has landed on my step for a reason. I feel blessed and honored to have had him land on my doorstep in his short winged life. I believe in the symbolism. Found a male Luna Moth outside my office in south central Oklahoma today, a very beautiful creature. It was flopping around in the grass, so I went to pick it up and it lighted on my shoulder and stayed there while I showed him off to my co-workers. We all oohed and aahed and I took him back outside only to go back a few hours later to find him covered in ants. I took him, brushed the ants off, and carefully placed him in my palm. We all felt very lucky to have found him today, not only did we get to see one of Gods beautiful creatures, we also learned so much about the Luna Moth. I hope someday to see another one. I found a cocoon in an old chest at the thrift store last month. I didn't know what was inside the small thumb sized cocoon so I brought it home with me, and tied it to a hanging plant inside my house on a book shelf with some hemp string. I have been talking to it daily for the last month, and when I would touch it, it moved. After close to one month, I went to talk to it again to find it completely emerged, and hanging on a leaf of the plant beside it's old house the cocoon. I didn't know if it needed some time to adjust to its new body so I left it alone for a day. This morning I didn't see it by my bookshelf, so I started looking around the house for it. It came into my bedroom last night while I slept, and has been hanging out on my bedroom wall all morning. I have a friend who lives a good way up a mountain close by, and I intend to take it up there to release it this evening. I wanted to give it a clear night with some moonlight. I have been reading about the symbolism associated with these, and I can only hope that it will be a symbol for me. Hello there, my father passed away this past weekend and shortly thereafter, we noticed a green moth that we had never seen on the deck next to the sliding glass door. I took a picture because it was so unusual and it was dead so it was easy to do. I did not think anything of it until my friend posted a sighting and picture of it on Facebook tonight. I have not seen her for years,yet we stay in touch because we have known each other for years. She is coming into town tommorrow for my father's funeral since she knew my dad well. This is now another symbolic occurrence out of several that have happened over the last week. The day that my Sister passed away I had taken my Mom to the Dr. When we got to the Dr there was a beautiful Luna moth sitting on the sidewalk. It was so striking that I stopped to take a picture of it. My Sister passed somewhere in the next 2 hours. She passed after a horrible battle with cancer. I know that she waited for us to be out of the house. I also know that the Luna was her, telling me that she is okay now. Had a beautiful luna moth on our porch all day yesterday. At dusk he went on his way. Made us feel like summer finally almost here. "My" luna moth arrived sometime between 5 and 8 a.m. this morning, resting on the wall right outside my front door window. It is so beautiful. I have been avoiding opening the door, so as not to frighten it off--although it sounds from what I've read here that it will leave this evening, when it's good and ready. Thanks for this good information. It has made the discovery of my little visitor so much more fun. Not a surprise that late May and the emergence of adult Luna moths across the northern states has led to thousands of visits to this post. I am glad that I could provide information that helps each reader know more about their visitor. We were forced to rent for a total of 4 years after being home owners for over 10 years. Well, we finally saved enough money and purchased a new home and moved in over the weekend. As the movers and I began bringing furniture into the house, I saw a huge, beautiful Luna moth clinging to the brick right at the entrance to our new home. I've never even seen one before. I feel like this was some sort of positive sign or symbol even though I'm far from superstitious. It just felt good to be greeted and invited into our new home by a Luna moth. I have spent the better part of the night caring for a male Luna moth who has lost most of the dust from his wings and has difficulty flying. He is perched on my left hand as I type, and I feel so lucky to have forged a bond with such a beautiful creature. he's the third Luna I have seen in my lifetime, and the other two occasions were followed by positive changes in my life - I can only hope he brings such good tidings! I have had a male lunar at my door for three days in a row now...First two days I shooed it away as I had never seen a creature like this before and was totally freaked out...I then googled it and found out it was a male lunar...rare in sightings and had a adult life span of 7 days. Of course then I felt terrible for shooing it away! It has come back though....today...right on my front door. Has been there since this morning and it's now 10:00 pm. I do feel he has picked me and my house for a reason:) He refuses to leave:) maybe he wants to mate with me??! My little guy wouldn't leave either But I didn't "shoo" him away out of fear.. I "shooed" him away so I knew he could fly. I will guess that you have a light by your front door that is on overnight. Hence the appearance of "your" moth in the morning. These moths are remarkably inert during the day. In their natural habitat (trees, green leaves) they are well camouflaged, so any movement is counter-productive. I hope that as of this morning the moth has decamped, hopefully to find a female. Saw a large Luna 2 nights ago on the garage door. I took its pic and posted it on fb where someone informed me that this was a Luna Moth. Then yesterday morning I was heading out to work and saw a smaller one in the grass. This one was identical in color, and the larger one was now down on the concrete. I took a pic of that one too and left for work. When I got home from work 10 hrs later they were both gone. Later my sister came by and said she had seen it (the smaller one) and she had moved it to a shaded area under some trees. She went and got it and brought it inside, she was going to put it in a small box but then it moved so she quickly put it back outside under the trees. Neither of us knew anything about the Luna Moth and I can't wait to tell her what I've learned. I do have a question, the larger one is the male or female? Females and males of similar size - wingspans 3.5-6.0 inches. And same coloring. Key difference is large, feather-like appearance of antennae on the male (look at photos in the post). These allow males to pick up scent molecules the females emit. Luna moths are immobile by day - weak fliers if disturbed. The thinking is that come night, they warm up their flight muscles by shivering before taking to the air. Congrats on your sighting. Today I arrived at my shop and found a Luna moth quietly perched outside my door. He is a silent wonder. I believe he is a sign of things to come. My sister and her husband have had trouble becoming pregnant and keeping a baby. She told me 2 days ago that she is 6 weeks pregnant and I feel somehow that this moth landed at my shop as a significance of new life, beginnings, and rebirth, just as suggested on this site. I hope my intuition is right and that in 8 months a new baby will bless there lives. While at work I noticed what was a large green leaf on the sidewalk. Upon closer inspection it was something I never seen before, a Luna Moth (before I knew what a Luna Moth was). It was about 33*F last night, and it appeared dead. I picked it by the tip of its long tail, and cupped it in my hands. It started MOVING! I took it inside my building where it proceeded to slowly shake, then flutter its wings. After ten minutes it was flitting around the room, but not yet flying. I had to take it outside, but placed it on a warm soft light outside of building. What an amazing creature. This morning my son called me to look at something, on my front storm door is a very beautiful Luna Moth. I have never had the privilege to see one and am mesmerized by its beauty. I hope it spends the day with me as it is my day off. I was so sad to learn of its short life span, anything that beautiful should live forever. I just came across one last night! He was beautiful. I live in TN and for the last 2 years a Luna Moth has perched by my front door! This year is quite a surprise as there are 3; two males and one female. They are all absolutely stunning! RW: Feel free to use any of my words - text or my poem. You are not the first to think a Luna alien. In his journal, Henry David Thoreau writes about coming upon one and thinking it quite tropical in appearance - too richly colored to be at home in austere New England. One of these moths landed on my front step one morning when I was on my way out for work. It kind of scared me at first because I'm already terrified of any oddly looking creature and when I went to try move it a little so I could get out the door it didn't even bugde. I looked it up on the internet to see exactly what kind of moth it was and saw that it's symbolismism is one that represents rebirth, regeneration, and a since of newness. I had been going through a tough time in that particular point in my life and was struggling to get out of a really messed up relationship I had been in for quite some time and felt that that was indication of my life getting ready to change. Little to my surprise, it was getting ready to change in a way I wasn't expecting lol. Not only was I going to experience a new life but a new life within my self. I found out I was pregnant with my very first child about 2 weeks after the sighting of this moth on my door step. I am currently 17 weeks pregnant. I never really been a strong believer of the significance of animals and plants and the meanings of how the can play apart in sometimes life, but I do believe now that the Lord Jesus Christ has a way of opening your eyes to plans and guidances He has for our lives. I am absolutely in love with the Luna Moth. Such an incredible breed with some very special meanings in culture. I woke up this morning and discovered a luna moth on my screen door it is noon and he is still there. At first I thought he was dead he Is attatched to the screen and not moving, So I did some research and he is just resting probably will leave tonight. My grandfather died in March of this year. He was my mom. The only person in my life who has never broken my heart or ever hurt me in anyway throughout a life of continuous chaos, abuse, manipulation, and pawning back and forth to serve personal agendas, starting from birth. I am thirty one now. And out of everyone, he was the one to go, which I've been spending my whole life trying to prepare for. This said, I have been up many nights thinking of him and how grateful I am to have been loved so unconditionally and accepted for exactly who I am, everything and in between. It is exactly mid may, a bit early to see full grown moths i'm learning, and at two am I Came outside to look at the clear waning moon. Right next to my feet six inches at most I see this gorgeous huge male just perched there. I was listenin ng to"in a black out"by leithauser and rostam on headphones, but it was dancing to the song and when songs changed, it stopped during the pauses . I took a long video, several pictures and even flash photos only inches from it. I was so loud and noisy and yet it just sat there calm and relaxed even though it was middle of the night which I see is their most active time. It was there for an hour before taking off, flew into my glass door and then somewhat confused made its way off into the night. I've never seen a moth like this or butterfly in person in my life, let alone relaxed inches by my side. I googled green moth and Luna moth immediately was first result. After reading this I literally broke down, as the last couple months have been so... Yeah. I could not describe in words how much I needed this core penetrating experience that I will remember so deeply forever. It was entirely spiritual. I am so grateful. Thank you. For me, it's the smallest acts of pure kindness that move me so unshakably. They go farther than any production or grand gesture ever could. Just a simple reminder of the love that surrounds us all the time in everything we are and do. A reminder that we're not alone, especially at the times we feel lonely the most. That even if it seems like years since we've felt the vibrant warmth of the sun, wandering aimlessly in the pitch darkness, we still always have the light of the moon, and with it the beautiful friends who solely live their whole lifetime by its light alone. I will never forget this. P - From personal experience, I've learned that when you reach out to love and healing - healing and love reach back. Peace be with you. A beautiful male luna moth came to rest upon our front door briefly throught the day last summer, it left that evening. Well to our delighted surprise, we've received a gift again this summer, we were all thrilled to find, yet another male luna moth. This time he landed upon our back yard door frame, and stayed for four complete days and three whole nights,not moving an inch. This afternoon he was the topic at hand, as we all wonderered why was he choosing to spend his entire existence with us. We began to think he may already be expired, that perhaps he was stuck there in place somehow, but after blowing lightly at him, he fluttered his wings and changed position of his feathery antenna a few times,so we realized he was still living. The kids began to ask for permission to be allowed to frame his body once he did pass on, which I was considering, since he didn't seem to be going anywhere and appeared to have staked out his final resting site. The luna moth arrived, suddenly. Bestowing, upon us, bewilderment, exasperation and awe. The luna moth, vanished, suddenly. Bequeathing onto us, bewilderment, exasperation and awe. In the blink of an eye,at 10:00p on night four,he vanished into the unknown. It is possible that he had already mated, and had no reason to go anywhere. Yesterday I had my first luna moth encounter in my nearly-60 years.I was surprised at the sight and in absolute awe at its beauty. I have been experiencing several major transitions in my life over the past several months--daughter and grandson leaving "the nest", newly discovered step son and step grandson, coming to grips with my "seniorhood" and more--and I feel strongly that this luna moth is a symbol of rebirth and joy for me. He was in the same spot again this morning, and I'm so grateful for the experience. I encountered a beautiful male a day or two after the eclipse we had. It was perched on the wall outside the door of our little town's county clerk office. It was a double treat for me since I haven't seen on since my childhood on my grandmother's porch. She always had them & I was actually going to get a tattoo to symbolize her passing & the wonderful memories I had sitting on her porch at night talking as we were very close. I hoped that no one dared touch the moth. I wanted to but I knew it was at the end of it's short lifespan. Always a beautiful sign to see! This was eastern Tennessee in August. I want to know more about the YELLOW one I saw please.